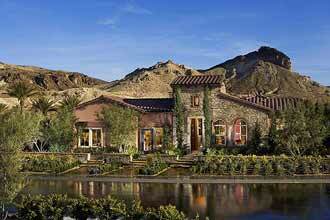 Luxury homes for sale in Lake Las Vegas discount home prices by up to $75,000. Three weeks ago two plans new floor plans were higher on The Falls Golf Course at the resort. Homes by Pardee are now priced from the $400,000s. The real estate development is located off of Lake Las Vegas Parkway along the main entrance of the resort. Beautiful scenery, amazing views of Las Vegas Strip and mountains can be seen from these golf course homes at Bella Fiore. New Las Vegas homes on the golf course in Lake Las Vegas by Pardee Homes are now available. The single story plans are showcased in The Falls Golf Course at the Bella Fiore gated community. The two new luxury single story homes include Bella Fiore Plan Five and Six. Bella Fiore Plan Five is priced from $553,950 and includes three bedrooms, 2.5 bathrooms, island kitchen, great room, dining room and a three car garage. There is 2,307 square feet in this new home. Tremezzo luxury homes in Lake Las Vegas real estate are located on a hilltop with beautiful views of Lake Las Vegas Resort. Tremezzo by Pardee Homes is a guard gated community with architectural design of Andalusian, Tuscan and Italian themes. Included features include intimate outdoor entertaining and large interior courtyards. The homes for sale in Lake Las Vegas four new floor plans have three to five bedrooms, range from 3,168 to 4,320 square feet and up to five baths and up to three car garages. Della Montagna Lake Las Vegas luxury homes by Innovative Communities announced the groundbreaking. Della Montagna homes have paired a wonderful location and luxury living in the resort. The gated estate homes for sale in Henderson, Nevada offer fully landscaped back and front yards. The new homes provide up to 4,000 square feet and lot sizes go up to 8,000 square feet. Home prices start from $1.5 million. A silver membership to The Club at Lake Las Vegas is received by each home owner.